Join the discussion on our forums! Come discuss Arrogant Crusader over in our dedicated Arrogant Crusader discussion topic. With this card, I'm honestly "damn the functionality and the strategy", I'd play him just for those funny as hell voice clips. I dont tihnk people know how this card works. Firstly its obvious you need to have taunt givers in deck. Bonemayer and spikeridged should be enough depending whether you have more of such minions like those who summon 8/8 skeleton. In such case i suggest adding sunfury protector since shes cheaper than argus and you already have expensive taunt givers. If it doesnt go off its kinda like fireball which can be saved for later after the mana had been used. But this should be done only at necessity. Overall its a pretty good card in nzoth paladin. I am using this guy in my divine shield midrange deck. He is really really good I have to say. 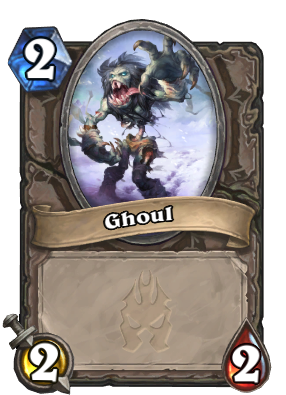 Most of the times I get the ghoul from him, because my opponents trade in him. Would be insane at 3 mana. Probably still good though in an aggressive deck. It's not like you opponent can ignore a 5 attack minion. A worse Piloted Shredder. Which is fine I suppose. Piloted Shredder is an insane card that I'd rather not see in standard again. Pack fillers under form of class card. Poor Paladin and it is even a rare not even common. Am I wrong in that this seems relatively decent? It ends up being 7/4 in stats if your opponent removes it on their turn. If they don't, you have the choice of where or what to attack with it. 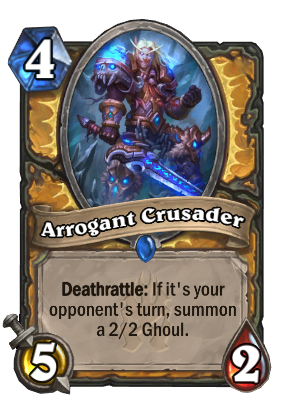 I can't say it's good enough to be constructed viable - especially with the glut of 4 mana cards paladin has, as well as how bad this is against low cost minions, but it doesn't seem like the worst card ever. In worst case it's a 4/4 if they remove it with 2/2 minion or something. But then again if it survives it can get rid of Tar Creeper or Sludge Belcher and cards like that. Decent card but I agree that it probably won't see play in constructed because there are lots of better options at turn 4.